A sign of Progress is that we are well on the way to eating all the fish in our oceans and replacing them with floating plastic. Last night i went to Laurie Anderson’s The Language of the Future concert in Miner Auditorium, the stunning new SF Jazz venue on Franklin Street. She was accompanied by jazz pianist Geri Allen, and the performance was very good, but frankly not as good as her solo performance The End of the Moon about her year as Artist in Residence for NASA, an interesting role since neither she nor NASA had any idea about what an artist in residence there would do. If she revives this show, see it. Here’s an eight minute excerpt. 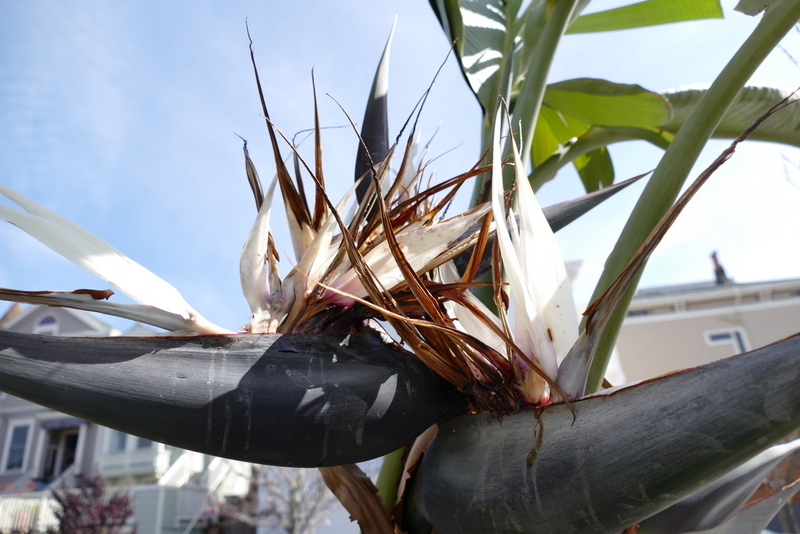 Oh, and here’s a closeup of a Giant Bird of Paradise grown by Oliver Graves on Hancock Street.